Benifallet has 725 extremely friendly and welcoming inhabitants, living a tranquil, easy-going lifestyle which you will find very alluring. In fact, once you get here you may not want to leave. The warm fuzzy feeling and sense of wellbeing experienced by just getting up in the morning and breathing in your surroundings is something you just have to experience to understand. The most enjoyable part of the day may be just relaxing watching the river flow by, or sitting outside one of the local bars having a glass of wine, watching the world go by and chatting with the locals. An essential part of being here and experiencing village life is a beaming smile and an “Hola!” or “Bon dia!” to everyone you pass in the street. The handful of shops in the village are all family owned and run. You have a choice of ten bars and restaurants, a bakery, two butchers, two “corner shops”, a cooperative botiga selling local produce, an olive oil mill, and a fish shop which usually opens around 3 times a week for a couple of hours each time...the village speaker system will let you know when the fish are in, in fact it keeps everyone informed of all the daily goings-on. It's our version of the town crier, when the music starts everything stops for a minute or two, people go to their balconies, people in the streets stop to listen while the “town crier” makes an announcement two or three times a day...maybe it’s to remind you that it’s Thursday and therefore market day, or maybe there is a film being shown at Casal’s Bar tonight, or the electricity meter man will be around today, or what’s happening at the fiesta; this is the village news. Local fiestas are part of living here, whether you live here all year round or “live” here for a week, you’re sure to find something happening, if not in Benifallet, then in one of the nearby villages. If you're here for New Year’s Eve you must be in the square with your 12 grapes for the midnight bells as you attempt to eat one for each bell…it’s harder than you think! But the most important fiesta is Benifallet’s Festa Major in September when every tiny street in the village is decorated and the celebrations go on for 5 days culminating with Catalunya Day on the 11th. Be prepared for no sleep when things like Battle of the Drums happen at 4am. Everyone congregates in the village square to cheer on Benifallet Band, then Tivenys Band (pronounced Tib-eng-tch), followed by a procession through the streets with much dancing, laughter and cheering. Even when you do eventually drag yourself to bed there will be no sleep because the brass band will be playing in the streets at 10am! (see the Fiestas section which is updated regularly). When it comes to eating out in Benifallet you’ll be spoiled for choice, and with the menu del dia of 3 or 4 courses including wine for around €10 per person, there is no excuse for not trying out the local cuisine at one or all of the village restaurants. Everything is made from local produce and, as well as the menu del dia, each restaurant serves an a la carte selection. Unfortunately, the words vegetarian and Catalan cuisine don’t necessarily come in the same sentence so you are not likely to see many vegetarian options offered, but they will be pleased to make up a dish for you. An interesting website in English about Catalan cuisine with receipes and photographs can be found at Eat Catalunya. You can also put Cuina Catalana (Catalan Kitchen) into Google translate to check out the ingredients of a Catalan dish. For accommodation in Benifallet, click on the "Holiday Rentals" tab on the menu bar on the left side of this page. The Coves Meravelles (Marvelous Caves) of Benifallet are wonderful underground caverns some of which were inhabited during the Neolithic age and still retain some of their paintings and bits of pottery, and which also served as a hiding place during the Spanish Civil War. 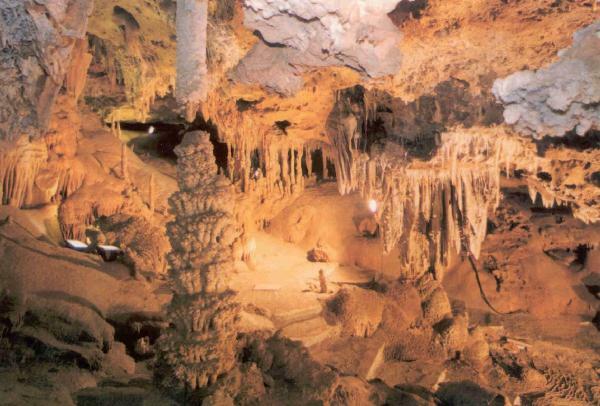 There are 6 caves in total but only two are open to the public, the Meravelles and Dos caves. 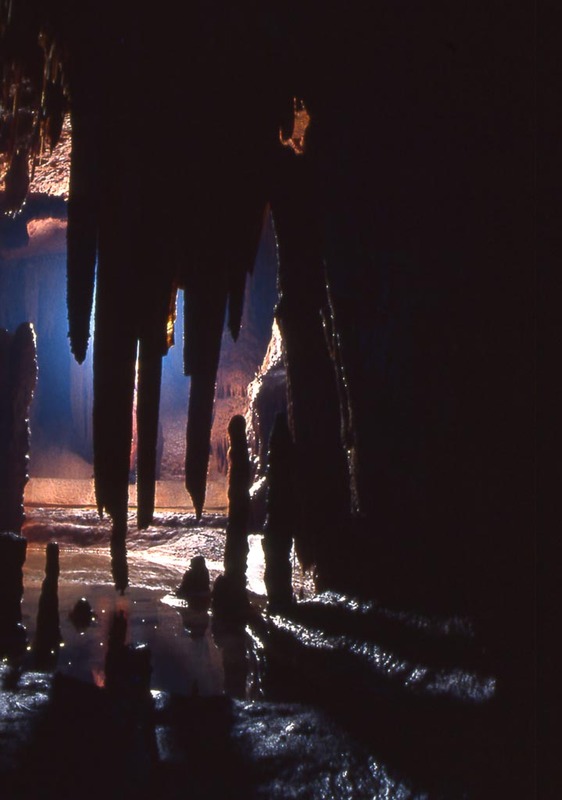 Situated up the mountain about 3 kms outside the village, they will amaze you with their stalactites and stalagmites. The slow dripping water consisting of carbonates have formed fascinating shapes which can keep visitors enthralled with their unusual beauty. 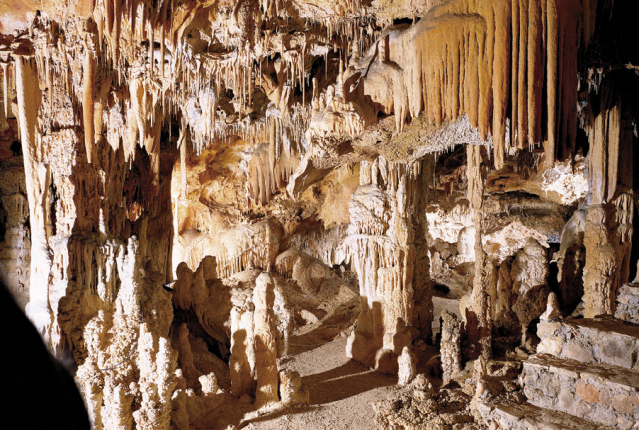 As well as the classic formations, you will see all kinds of structures, such as columns, flowstone and curtain and straw stalactites and, particularly impressive, forms that seem to defy the law of gravity. Every year on 1st May there is a major fiesta at the caves with local music, dancing, food (paella or another local delicacy, bread, dessert, fruit) , unlimited wine and of course a guided tour of the caves. The locals take an array of food with them as well to make a real party of it. For the rest of the year there is a bar and restaurant or you can just sit and admire the amazing views. Guided tours take 45 minutes. The history of Benifallet dates back to the ancient inhabitants of the mountains and valleys who, in the Neolithic era, left cave paintings. Other findings include pieces of Phoenician ceramics from the 7th century BC, a part of the original wall from the Iberian period when the Castellot de Roca Roja was built, and, from the Romans there are some remains and a dam still visible. The current site of the village appears to have been established around the time of the 1st Crusade and the name itself is thought to be of Moorish origin. However, the first documents recognising the village were discovered as a result of the conquest of Tortosa that took place in December 1148. In more recent history, during the civil war Benifallet was occupied by the Spanish Republican army throughout the Battle of the Ebro, 25th July to 16th November 1938. It was the most bloody battle of the civil war and the Coves Meravelles were used as shelter for many soldiers during this troubled time. The Nationalist Army, commanded by Queipo de Llano and Francisco Franco, fought with 80,000 men against the 100,000 strong 2nd Republican Army, led by Juan Modesto and Enrique Lister. The Republicans suffered a heavy defeat with 30,000 dead, 20,000 wounded and 19,563 captured while the Nationalists only lost 6,500 men with 30,000 wounded and 5,000 captured, This defeat destroyed the Republican Army. For more information on the Battle of the Ebro click here. The Llaguter bridge over the River Ebre was built in 1991, before that time crossings had to be made by medieval ferry as is still the case for the village of Miravet just upriver. Take the Benifallet village boat on an incredibly scenic trip to see life from the river and if you can tear your eyes away from the stunning scenery, watch fascinated, as the cormorants dive for their lunch or the struggling fisherman in his little boat attempts to land his huge catch. The municipality encompasses the Cardó Mountain Range with its peak of 941 metres and the drive up to the old spa delivers spectacular views over the area. Originally the building was a monastery for the Carmelite community and was founded in 1606. Near the monastery there were a set of fourteen hermitages spread along all the mountain of Cardó and some are still intact. In the last thirty years of the 19th century, a thermal spa was opened, utilising the medicinal properties of the water which is very rich in bicarbonate and arsenic and had been declared of public interest in 1887. The spa was used as a republican hospital during the Spanish Civil War in 1938, then in 1967 it opened again as a spa; but today is lies empty, a magnificent site at the top of the mountain. There are rumours of it being opened as a 5 star hotel but at the moment the only activity is from the discreet water bottling plant beside it and the trucks bringing down the crates of Cardó water to be sold. Benifallet is renowned for its peaceful life and, as with all the villages and towns, its ability to turn any occasion into a fiesta. Below are dates of just a few of the Events & Fiestas, others can be found on the Fiestas page. 5th January – Fiesta de Reyes (Three Kings Day) – this tradition was started many years ago by the Jóvenes Asociados de Benifallet (Youth Association) in conjunction with the A.P.A. (Parent-Teachers Association). The three Kings arrive in the village via the Benifallet boat and a procession follows them to Casals Bar which is decorated as a Nativity scene and where presents are presented to the children of the village by the 3 Kings. Benifallet is the only village in the area that celebrates this day and as a result they have many visitors joining in that day. 1st May - Fiesta de la Coves - In 1994 the Ajuntament de Benifallet started arranging tours to the caves, this was so successful that they decided to dedicate a day to the visitors of the caves. The ajuntament together with local volunteers arrange the food for all residents and for tourists with entrance tickets to the caves. Traditionally toast with garlic & olive oil, butifarras (local sausages) or paella, wine & coffee are served. Once the meal is over all the visitors go through the caves followed by music and dancing. 14th & 15th June – Firebre (Tourist Fiesta) – this fiesta was started in 2006 to celebrate the river with all it's activities, to encourage tourism in the area and to secure the economic future of the village. One buys a book of ten tickets for around €10 and each ticket will buy you one dish at your choice of the village restaurants stalls at all time over the two day fiesta. There are also stands along the river front displaying the different activities, fishing, canoeing, boating etc on the river, as well as stalls with local produce such as honey, olive oil and an art exhibition of local artists. Saturday evening is an evening of entertainment with amateur theater, Sunday there is a fishing competition and evening of entertainment with singing etc. 23rd June – Fiesta Verbena de San Juan – an important fiesta in Catalunya, the young people of the village make “Muñecos de San Juan” dolls made of old clothes and stuffed with sawdust. These are then brought and burnt early in the evening – this represents the removing of bad feelings and cleansing of thoughts, they sometimes jump over the coals to aid the process. After this the Asociación de Mujerus Maravillas (Womens Association) arrange a feast with music and dancing which goes on throughout the night. 6th to 11th September – Festes Majors – this is the main annual fiesta which is celebrated by different activities through the day in the Placa Mayor with the dancing of the “Jota” as one of the main features. The 8th is dedicated to the young women of the village, the 9th to the children and the 10th to the elderly people. Every evening there is entertainment and a dance throughout the night held in a large tent on the river front. The 11th is Catalunya Day and there is a paella or fideuada popular under the trees on the banks of the Ebre with games, music and dancing. November - Fiesta Gastronomics – a celebration of the local cuisine which is held at the Casals Municipal Bar. 25th & 26th December – Fiestas de los Quintos – the “Quintos” are the young men who were called to serve the country in the army, the fiesta was started to help the young men to collect some money for their time in service, today not many young men actually serve in the army but the fiesta still remains. Tickets for all fiestas may be obtained at the Ajuntament (Town Hall) in the week before.